Things that go bump in the night, with plenty of tricks + treats. The Shoreline is the perfect place to be for Halloween for kids and adults, alike! Between haunted houses, trick-or-treating, fall festivals, and holiday shows - we have your October booked! Find the perfect pumpkin while enjoying activities at the Little Red Barn. Fun kid activities include an apple train, hay tunnel, hay pyramid, tractor track and corn kingdom. You will also enjoy a beautiful selection of mums, corn stalks, apple cider, wine and baked goods. Head north for PYO apples and corn maze! 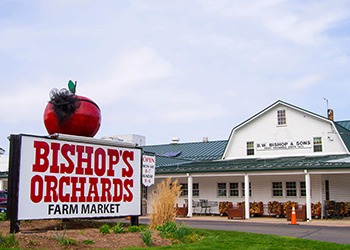 Enjoy pick your own apples and catch a tractor ride through the farm. You may even spot a pumpkin head at the wheel! Also enjoy the farm’s grill + creamery. Voted the best ice cream in Connecticut! View even more events here!